Hip Hop Kaslam is an NPO and pioneering movement that provides a platform for young rappers to perform in languages indigenous to Africa. 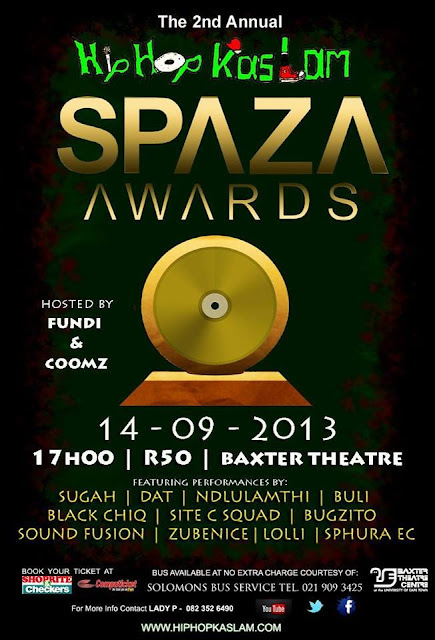 Join us in our second annual Hip Hop Kaslam Spaza Awards, where we will celebrate a unique hip hop genre emerging from the streets of urban townships, Spaza Hip Hop. Rising talent ranging from Spaza emcees to beat makers to poets will be awarded during the celebration, for pushing this edgy strand of Hip Hop forward. Audiences are encouraged to come to the event; it promises to be a kaleidoscope of Cape Flats entertainment! The nominees will be reviewed and assessed by a panel of judges which consists of hip hop industry professionals. They are required to vote based upon quality alone, and not sales, popularity or personal relationships. There are two people’s choice awards, Best Song and Best Performer, which will be voted by the audience on the night of the Awards and one award – Best Hip Hop Kaslam Supporter – which the founders of the movement, Dat and Lady P, will decide upon. The Spaza Awards will be taking place on Saturday 14th of September 2013 and will run from 5pm till 8pm at Baxter Concert Hall in Rondebosch. The dress code is ‘blinged up’. Tickets are R50 and are available from Computicket, Shoprite or Checkers outlets. Block bookings of 10 or more pay only R40 a ticket. A bus will be available to pick up and drop off audiences in Khayelitsha, Gugulethu and Delft; the bus is sponsored courtesy of Solomons Bus Service. For more information contact LadyP on 082 352 6490 or email awards@hiphopkaslam.com. For interviews and picture requests please contact Lady P on 082 352 6490 or email ladyp@hiphopkaslam.com.